At a basketball game last weekend while sitting at the scorers tables keeping book, I was asked by a ref whether or not I believed that whiteness was real. It wasn't a totally random, inappropriate question--I had Denise McCoskey's book Race: Antiquity and its Legacy and he saw it sitting there. I think I must have looked at him puzzled, but then said "Yeah. It exists." I mean, I find the whiteness of my normal environment kind of overwhelming sometimes--our whole team (6th grade girls travel ball) and pretty much all of our teams generally in my town are 100% white. And we were playing an almost entirely black team--the reality of our whiteness was pretty obvious. This is a normally odd feeling for someone who grew up in a minority white place with a mostly non-white family. And, yes, I think about (and write about and talk about) race all the time, so the question should not have puzzled me--the context just threw me for a second. But it also got me thinking about how I often respond to questions about race in antiquity--all the caveats and the definitions and the fine distinctions and nuances. And then I thought about why we so often try to avoid talking about race in antiquity at all (we talk about "ethnicity" instead) and all the reasons we give--why I have done so, even. And then I thought about how I would have talked to the ref at the game about all of this and how big of an eye roll I would have gotten. "Race is a social construct" and so not real and so we can ignore it. Except that social constructs are thoroughly "real" in their impacts and in shaping the worlds we live in and study. I think for many of us, myself included, to speak of ethnicity carries less baggage than to speak of race, but also, to speak of ethnicity is easier because we can connect it to the Greeks, at least, through the term ethnos, while race is "foreign." In my book on metic ("immigrant") women, I used ethnicity to discuss individuals mostly because people were identified on their tombstones by an ethnos--their city of origin, and most of the foreign women in Athens of the 5th and 4th centuries BCE were Greeks, too, just not Athenians. But there was and is a valid reason for me to have talked about race, which I did, but maybe not enough. If we think about what race is, its really a way of thinking, not a "thing." It's a way of thinking that assumes hierarchies. It assumes one group of people is inherently better than another. It assumes that there is a connection between geography and identity that can't change--that you take the geography of your primordial origins with you through time and space. The Athenians believed in something like this. Its why some of us (Susan Lape, importantly, here and here) talk about race and racial identity and citizenship--the Athenians very clearly believed that they were superior to others inherently based on their birth (indigenous to their land--an autochthonous birth unrelated to the descent of other humans) and that they had to preserve this superiority by rejecting intermarriage with non-Athenians (anti-miscegenation) and in this way retaining their purity. This is pretty close to race and race thinking in in the modern world. So, the women I studied were excluded and legally oppressed because of their race--they weren't Athenian. Didn't matter that they were Greek. And yet, while I talked about "racial citizenship" and "racial thinking", I didn't use the word "race" but "ethnic identity" when speaking of individuals and the group they belonged to. That's kind of cowardly of me, in some ways. Whatever other types of identities they constructed, Athenians had a concept of "race" that maps pretty well onto ours--even if they didn't have anything like modern race science to underscore it. In truth, no identities are "real," if by "real" we mean an impermeable category that someone is born into that is defined through immutable characteristics. That "real" doesn't exist. No identity that we have (internally of externally constructed) can meet this criteria. Does that mean identities aren't "real," though, in the sense that they matter in the way we navigate the world around us? Could I have explained this to the ref at the game? That, well, yes, I study ancient Athens and they were racists and were the "white people" of their day, even though the only actual "white people" in the city would have been the rich women or the Scythian slaves or someone with a bad skin condition or disease? He probably would have asked me why I would want to study a bunch of racists. I think some of us still struggle with the answer to that particular question. I don't say "objective manner" for a reason, though. Because when we talk about issues like sexual assault (which the above commenter is referring to) or race and racism, objective is really just another word for "not an issue I have to deal with" or "privilege." And it is also something that results from the viewing of "black" as a race but not "white." If we "don't see race" or think that we can deal with it "objectively" or "rationally" it's because we have lived without its weight for most or all of our lives. We academics, especially those who deal with the distant past, are trained to abstract ourselves. 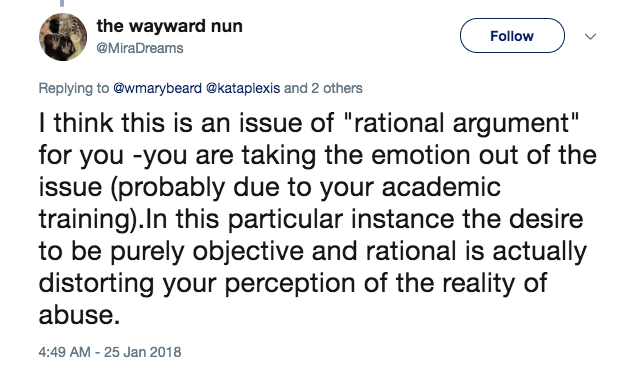 But, as I tell my students all the time--objectivity is a myth (which is what ideals are); whoever writes the narrative or compiles the evidence and pieces it together is a subjective part of the history. Whoever asks the questions and sets the parameters for the experiment or interprets that resulting data has included their subjective self in the study. There are no self-evident, self-monitoring, self-completing, self-narrating events, studies, or experiments. All we can do is be aware of our subjective input and do our best to not let it overtake us. 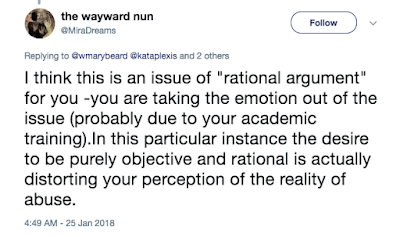 And we need to recognize this when the quest for objectivity leads us to split hairs and our lack of experience leads us to only be able to theorize and not be able to engage with our object of inquiry when they are a real person's subjective reality. Race is a reality too many of us scholars on race and ethnicity in antiquity have trouble thinking about in anything but an abstracted way because we project race (regardless of our knowledge that skin color =/= race) onto people of color both in our field and in our studies and leave whiteness as a colorless, raceless norm. We assume whiteness for the Greeks and Romans even when we don't mean too because we only ever picture race and ethnicity in antiquity as non-Greeks and Romans. But white people have race now and ancient Greeks--the Athenians, at least--also had race then. And still we treat "race" like a historically contingent nuisance that we can articulate away through philological sophisms and rhetorical sleights of hand. We act like it is our scholarly responsibility to place it on its modern shelf and not taint our ancients with. It's one of the many reasons we have a racism and race problem in Classics. None of this ruminating helps me with the problem of being able to articulate a history of race to the ref on the fly during a time out. But at least I can be a little more honest with myself as I prepare to do more scholarship on the history of race in antiquity and classics' contributions to modern white supremacy. For a recent discussion of some of the dynamics of racism and race in our field see "Episode 51: Race & Racism in Ancient & Medieval Studies, Part 1: The Problem." Episode 52 (Part 2) is coming out Wednesday. A good discussion of the terms for race, ethnicity, nation, etc. in the Greek, Latin, and Anglo-Saxon is their "Episode 44: 'Us' & 'Them' in the Ancient and Anglo-Saxon Worlds." *A reference to the Twitter convo I had with Mary Beard the other day on how using the USA Gymnastics case to talk about the need for sentencing reform was a bit tone deaf and she shouldn't be surprised if people just didn't have time for it. The commenter above joined the fray and said some very thoughtful things.